What to write about an album of which you expect it to be the best album of the year? What to write about a band comprised of excellently skilled musicians/songwriters that exceed themselves with every album? That’s right, I’m talking about the rock/metal goliath Mastodon, who offer us their fifth full length (including Call Of The Mastodon) entitled Crack The Skye. After water and earth they bring us a record with yet another element; air, or sky. 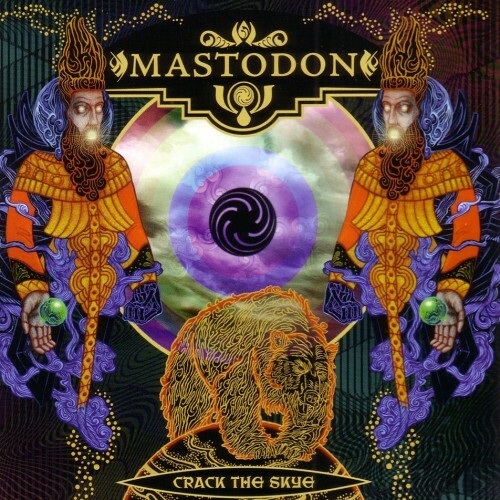 Basically every fan of Mastodon knew what direction Crack The Skye would be taking, as the band dropped hints in every interview claiming that it would be way more 70s prog rock. And this is exactly what you find on Crack The Skye, the band has incorporated that particular sound of the seventies perfectly into their own, creating an album of epic proportions. Honestly the first time I played it, it was over before I knew what was going on and I felt a bit conned. But the more I played it (like a good 30-40 times by now), the more it grew on me. There’s so much happening on Crack The Skye, I can’t even mention it all in this review. I’ll give you the main points instead. The most important thing on this record is again the upgrade of vocal use. There are barely any screams left on the entire record, almost everything is melodic now. Also drummer Brann, who is probably the most emotional involved person for this record as it is named after his sister Skye who passed away as a kid, sings a lot more on this record. He is the first person to sing on the opening track ‘Oblivion’. To some this evolvement is a bad situation, to others it is the best step they could take. I personally love it, yet I kind of miss the screams from time to time. Luckily the title track features Neurosis’ Scott Kelly delivering some brutal screams, a blunt relief from all the melodic vocal lines. As you might expect, the brutal riffs have also made place for more melody. This doesn’t mean Mastodon has become an emo band all of a sudden, these guys are too skilled to take the easy way out and just strum some chords. It’s more that the songs take on epic proportions with vast, long stretched riffs, tight beats, fantastic solos and quite some Hammond organ in it. Also there are a lot of small percussive additions in all the songs, done by drummer Brann again. Two of the songs even managed to make it over ten minutes, forming epic journeys filled with twists, turns and hooks that only this band can deliver. Especially the final track ‘The Last Baron’, which clocks in at thirteen minutes show the true capabilities of Mastodon. The record features a making of DVD again, which is very nice to watch, like usual with these guys. A lot of idiotic humour and a lot of happy campers who are having the time of their life. But also some more serious material, like Brann dealing with the death of his sister and guitarist Brent dealing with being hospitalised. Again a nice peek in the lives of this foursome.